There is a huge variety of bathroom accessories available for your every need or desire. You can obtain anything from towel warmers to radios that play in the shower. There is seemingly no end to the handy little accessories and big ones too. Bathroom Accessories of All Kinds. Explore the possibilities! Small and trivial bathroom accessories. Just a partial list would include shower curtains of many kinds towel holders and towel warmers, wastebaskets, soap dispensers of all kinds, shower heads, toilet brush holders, toilet tissue dispensers, toothbrush holders, bathroom fans, and hampers. There are more, I’m just out of breath. Bathroom storage accessories abound as well. Bathroom storage comes in a multitude of sizes and shapes to accommodate the smallest and the largest bathrooms. If you’re looking for extra storage, then there are cabinets, shelves, vanities and hampers. Vanities can combine contemporary design and provide storage space to create style and function for your bathroom. Floor mats can add comfort and be decorative at the same time. Store towels in bathroom cabinets. Maximize space in the bathroom with space savers and tank toppers. Add freestanding or wall-mounted shelving. Wall-mounted jewelry cabinets can keep necklaces, bracelets and rings in order and out of site. A Heated Floor System uses electric radiant heat mats or wires to generate heat under tile, hardwood and carpeted floors in bathrooms or any room. You can lower the air temperature in the room and by keeping the floor warm under your feet, you stay comfortable. Perfect for wood or concrete sub-floors, these heated floor systems are great when you are replacing your existing floor covering or working on a new construction. Thermostat accessories allow you to time the temperature of your floors to your liking. Heated floor mats are available in many different widths and lengths to fit rooms of any size. The mats bond easily to underlying floor materials and are easy to install. First, tape the mats in place with special tape. Then connect the mats to the thermostat. Once the thermostat is installed, put tile adhesive over the heating mat and then lay your floor. The heating wire system is ideal for irregular shaped rooms and comes in a variety of lengths. The wires use a single-point connection and are grounded from end to end. A metal jacket protects the wires. Installation is easy. First, the wires are laid out and fastened to the sub-floor. The thermostat is connected, the tile adhesive is put over the floor and wires, and then the floor can be installed. Be sure to use a certified electrician for the wiring. Add the benefit of warming and drying your towels without having to run the dryer. With a wide range of products to choose from, there’s a towel warmer for every bathroom. Bathroom accessories normally don’t save you time or water. No more standing naked waiting for the darned hot water in the shower to actually get hot. Add the convenience of quick push-button hot water and save thousands of gallons of water, reduce the waiting time for your hot water, and add convenience to your life. The Chilipepper speeds hot water from your water heater to your fixtures without running water down the drain. Whoever heard of a water saving device that actually adds convenience, instead of being inconvenient like low flow and 1.5 gallon flush toilets? 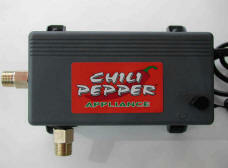 In many cases a Chilipepper can provide quick hot water to several or even all of the hot water fixtures in your home. If your home has one main hot water run from the water heater that loops from location to location, then a single Chilipepper will provide quick hot water for your entire home. Just place it at the location furthest from the water heater. When you want hot water, you just press the start button and the Chilipepper begins pumping hot water from your water heater to your fixture. The cooled off hot water in the hot water piping is forced into the cold water line where it flows back to the water heater inlet. In other words, it pumps the water in a big loop. That way no water gets run down the drain while you wait for your hot water.